Oppo has launched Oppo A5 smartphone in China and it is expected to launch in other region as well. Oppo recently also launched FindX smartphone with pop-up camera with unique software and features that would also be launched in other region as well. 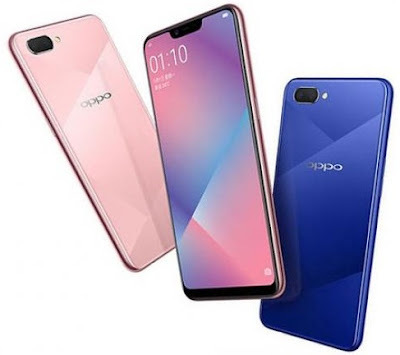 If you are looking for a bit information on Oppo A5 key features, technical specifications and price detail apart from its review and comparison (later) then you would find them over here. The top-notch design A5 phone is powered by 1.8GHz octa-core processor and coupled with 4GB of RAM. The internal storage of the phone is of 64GB which can be further expandable up to 256GB. The Oppo A5 runs with the latest Android Oreo operating system and the device comes with 13 megapixel rear camera and 8 megapixel front shooter. We will furnish more detail later. You may check its full specifications, features and price detail below. Sensors: Proximity, Accelerometer and Ambient light etc. Tips: Oppo has released finest smartphones these days and you can check it live then buy it.